The LeithLate15 festival closes with the Polar Twins exhibition – the result of an artist exchange between Edinburgh and Copenhagen in association with the City Link Festival. LeithLate has curated the Edinburgh side of the exchange and is facilitating the exhibition installation. Polar Twins opens on Thursday 24th September from 6-9pm, sponsored by Thistly Cross Cider and Edinburgh Gin. Trips between the two cities have already been made: the Scots to Copenhagen in April and the Danes to Edinburgh in June. We are thrilled to see the results of their interactions at Leith’s most exciting new arts venue: Biscuit Factory. The exhibition opens on Thursday 24th September and runs until Sunday 27th September, opening 12-6pm each day. Participating Scottish artists include Jessica Harrison, Kevin Harman, Rabiya Choudhry, Jamie Johnson and Anneli Holmstrom. Participating Danish artists include Luise Sejersen, Peter Voss Knude, Christian Bang Jensen, Lisa Bregneager and Suada Demirovic. The Danish side of the exchange was curated by Miriam Wistreich. A number of the Scottish and Danish artists will also be participating in a special Edinburgh-Copenhagen exchange edition of Neu Reekie at Pilrig Church on Saturday 26th September. Booking necessary. There will be an after party taking place at Victoria Bar after the Neu Reekie event with LeithLate DJ’s. 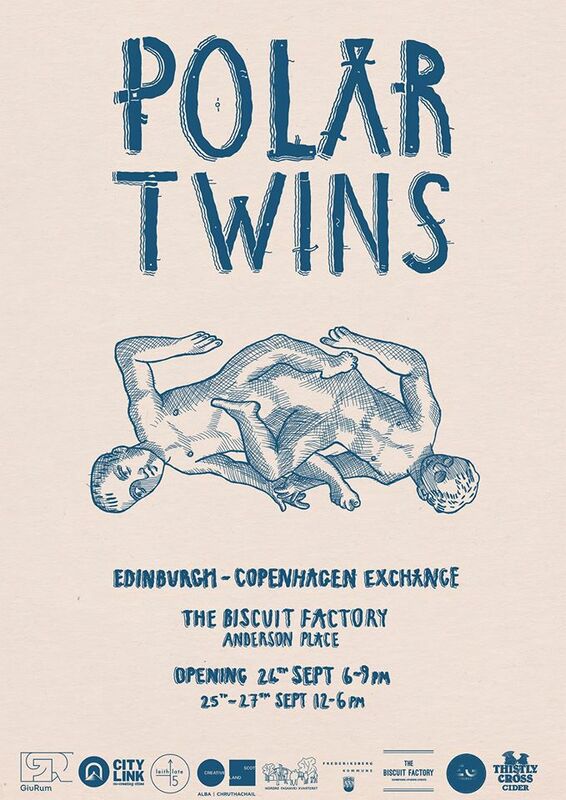 Polar Twins is supported by Creative Scotland, The Biscuit Factory, the Danish Arts Foundation, GivRum, and Områdefornyelsen Nordre Fasanvej.